4/15 Ultrain announced the official launch of its mainnet, marking another step forward for the world’s leading commercial public chain. This achievement makes Ultrain the first blockchain 3.0 project to launch an operational mainnet. A milestone of such magnitude represents a major breakthrough, not only for Ultrain as a project, but for the blockchain industry as whole. Ultrain’s core product is providing reliable, secure, and cost-effective trust computing service to both enterprises and individual developers. Ultrain was founded at the end of 2017 by three top business and technology leaders: Ray Guo — the former technical director of Alibaba’s security business group, Emma Liao — former managing director of Golden Brick Capital, head of IOT for Qihu360, also a seasoned long term M&A banker, and William Li– the former tech head of Ant Financial blockchain team. Other core members include Yufeng Shen — Ultrain’s Chief Architect, former senior technical expert of Alibaba’s operating system “AliOS” and core architect Google Canada ChromeOS, and Husen Wang — Ultrain’s Chief Cryptographer and former lead cryptographer at Ant Financial Blockchain. Last but not least, Ultrain’s newest member, Samuel Xiao, completes the team as VP of ecosystem and business development. As a former partner and CTO of Green Pine Dream Capital, Samuel is responsible for investment and post-investment management. Such dream team brings together expertise in cutting-edge innovations, sophisticated engineering experience, and extremely powerful global business access naturally attracts the attention of the world’s top investors. Subsequent to the initial seed round funding of 4 million CNY in October 2017, Ultrain successfully completed angel round financing in May 2018, with Morningside Capital as their lead investor, along with APlus capital and DraperDragon. Ultrain announced soon afterwards that it subsequently raised $20 million in private funding from global venture capital firms and crypto funds, placing the company at a 200 million USD valuation. Participants in this round of financing includes Danhua Capital (DHVC), Sky9 Capital, FBG Capital, Ceyuan Venture, 8 Decimal Capital, NGC Capital, ANMI, and other well-known investing entities both within China and overseas. Ultrain presents itself as a commercial chain that provides trusted computing services to businesses and commercial clients, leveraging Ultrain’s high performance, low cost, and data protected public chain to help enterprise customers develop blockchain solutions. Ultrain currently is the highest performing blockchain 3.0 project in the world, as well as the only public chain capable of providing commercial service to enterprise clients. Ultrain has also launched on the Microsoft cloud service market and is connected to Microsoft Azure’s joint sales system. Microsoft listing has helped Ultrain to expand its enterprise customer base, and is now cooperating with international Top 500 companies, in addition to established partnerships, with companies such as streetwear and e-commerce giant YOHO!, blockchain game developers Unitopia Gaming, and energy company Great Resource Energy. Ultrain is eager to further explore blockchain adoption in the fields of e-commerce, gaming, energy, advertising, healthcare, and philanthropy to name a few. The creation of side chains is based on the business demand in the service layer and can be dynamically adjusted accordingly. Compute and storage resources are separated across each side chain, which allows the network’s transaction capacity to continuously grow. This core technology allows Ultrain to maintain low cost without compromising performance. Sharding technology is normally restricted by 1/n mining rigs within the network, where n repents the number of concurrent shards allowed. With fewer rigs, network security is reduced and becomes vulnerable for attack, making 1/n a critical constraint that limits the progress of sharding technology. Ultrain’s innovative dynamic randomized node scheduling allows mining rigs to be dynamically assigned between chains or shards. The mining rigs are randomly shuffled and scheduled to different sharding segments at any given moment, which greatly improves the safety of the network. Ultrain’s solution is a cross-chain protocol between the main and side chains, with light client support, which implements an inter-chain communication mechanism based on committee voting. This is the first time a secure PoS-built light client (eg capable of defending against long-range attacks against PoS consensus) has been achieved. Ultrain’s economic model guarantees that system resources are not oversold, while the network resources are centralized with individual parties. A dynamic and optimized balance of all parties’ interests is maintained, with miners who contribute computing power to the chain receiving expected returns, while cost and quality of resource usage for developers can be predicted and costed accordingly. Ultrain’s smart contract coding language is based on TypeScript, while its full stack development framework — Robin and U3 — are based on NodeJs, and the virtual machines are based on WebAssebmly. These languages receive the best of both worlds since they allow easy contract development and deployment without compromising security. At the heart of Ultrain’s innovative Random Proof of Stake consensus algorithm is a Verifiable Random Function and a Byzantine Fault Tolerant algorithm. This technical approach had achieved 1000 TPS on a single-chain within a decentralized environment with a 10 second confirmation time. Those two indicators are crucial in the field of public chains, and Ultrain has considerably outperformed other existing public chains. Random number generation is the fundamental enabler of RPoS consensus. 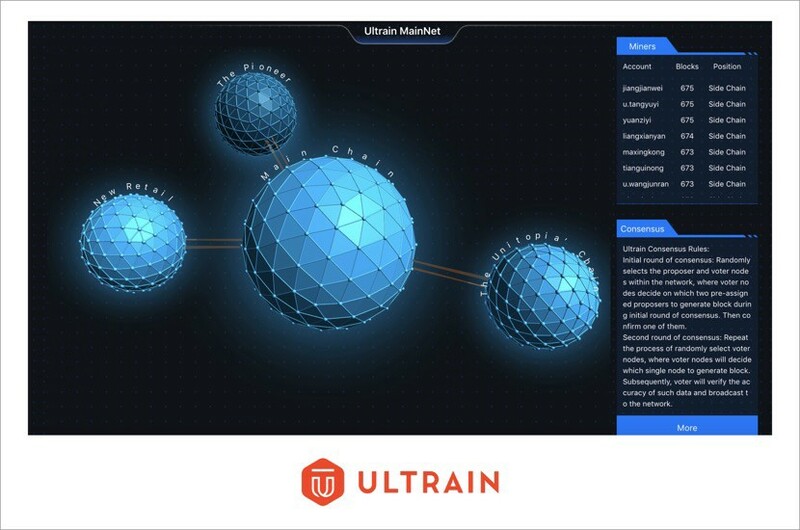 Ultrain’s implementation is based on a VRF, which Ultrain uses to create an innovative dual-layer architecture that resolves the common issues with random number generation, such as complicated setup processes, refusal to submit or propose, and collusion or manipulation between participants. It also eliminates the concern of network storms. Ultrain’s consensus mechanism has a significant enhancement in security, fairness and performance compared to other projects. Voter messages and certificates are combined to form aggregated signatures, which greatly reduces the size of voter messages and facilitates rapid message exchange. In addition, it supports a lightweight client and cross-chain requirements, reducing the size required for a client’s blockchain synchronization. Aggregate signatures also supports faster broadcasting of blocks while maintaining the system’s TPS performance and security. 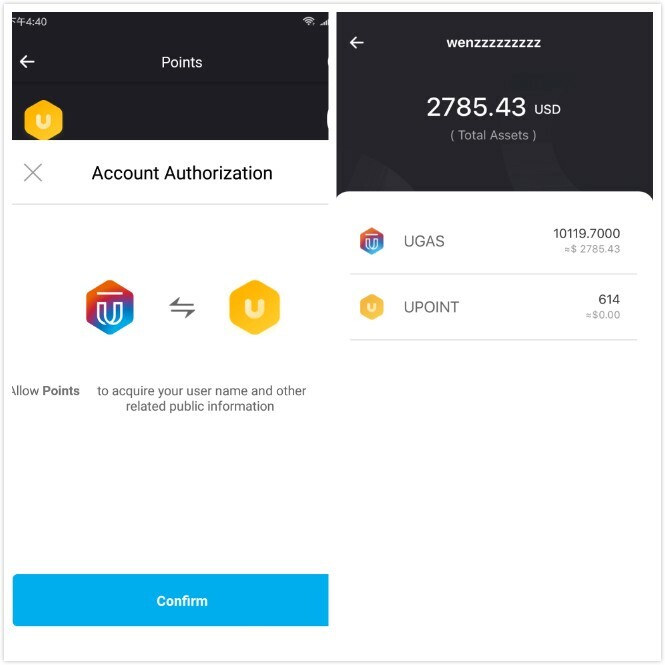 Ultrain’s official App — UltrainOne — provides multiple users functions, such as an official multi-chain wallet with an elegant user interface and fast transaction completion. UltrainOne is currently allowing users to create a mainnet account for free as a limited time offer. 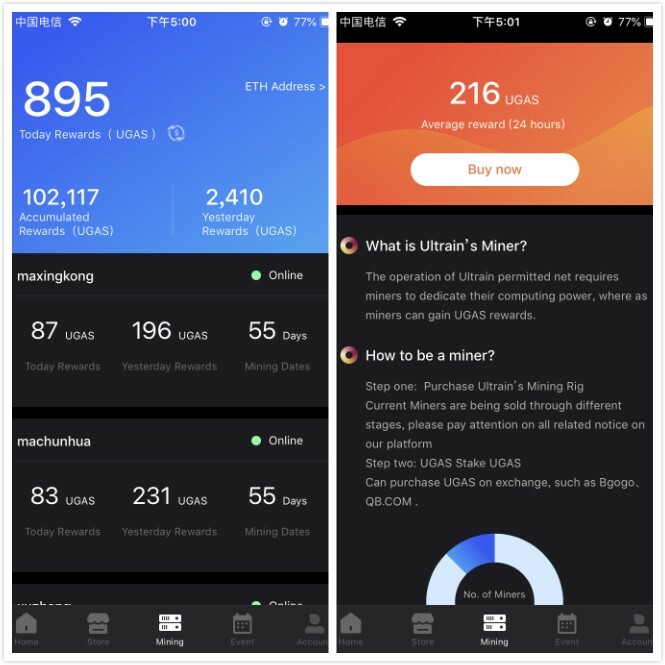 It is the go-to App to experience fast transactions, monitor real-time mining revenue from Ultrain’s chain, as well as receive the latest news and updates from Ultrain. The official launch of the Ultrain’s mainnet symbolizes the start of a new era for public blockchain 3.0 technology. Ultrain is the world’s first decentralized, high-performance public chain to implement a randomized dynamic sharding architecture, as well as the first to provide services to commercial clients. This mainnet launch marks a major milestone for Ultrain, and represents another leap towards its ultimate goal of creating the programmable business society of the future.